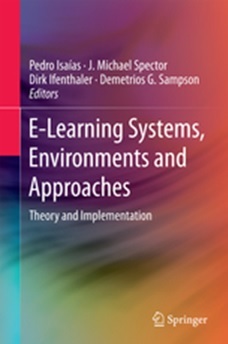 The volume consists of twenty-five chapters selected from among peer-reviewed papers presented at the CELDA (Cognition and Exploratory Learning in the Digital Age) 2013 Conference held in Fort Worth, Texas, USA, in October 2013 and also from world class scholars in e-learning systems, environments and approaches. The following sub-topics are included: Exploratory Learning Technologies (Part I), e-Learning social web design (Part II), Learner communities through e-Learning implementations (Part III), Collaborative and student-centered e-Learning design (Part IV). E-Learning has been, since its initial stages, a synonym for flexibility. While this dynamic nature has mainly been associated with time and space it is safe to argue that currently it embraces other aspects such as the learners’ profile, the scope of subjects that can be taught electronically and the technology it employs. New technologies also widen the range of activities and skills developed in e-Learning. Electronic learning environments have evolved past the exclusive delivery of knowledge. Technology has endowed e-Learning with the possibility of remotely fomenting problem solving skills, critical thinking and team work, by investing in information exchange, collaboration, personalisation and community building. Editors: Isaias, P., Spector, J.M., Ifenthaler, D. & Sampson, D.G.